I am a fan of Illumination animated movies, and an especially big fan of the Despicable Me franchise. I, like many Illumination fans, wondered if the minions could actually carry their own movie and make it entertaining. Minions turned out to be a lot more entertaining than people had anticipated and brought in over $1 billion in box office returns around the world. 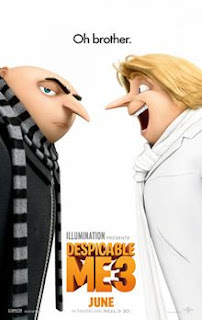 Those of us that closely follow the movie industry could just tell that Illumination was concerned that Gru might not actually be the main character in the Despicable Me franchise, especially after the minions did so well in their movie. Despicable Me 3 looks like Illumination's attempt to get the franchise focus back on Gru, and it may not achieve its goal. After making a series of successful movies in a franchise, it is common for a movie studio to start forgetting what made those previous movies successful and start leaning too much on the characters people know. The main ingredient for success in any Despicable Me movie is chaos and how each character handles that chaos. While Despicable Me 3 is funny in more than a few spots, it is way too linear in its story line and it lacks the kind of chaos that made the previous three movies so funny. Gru meets his brother, and instantly I envisioned one hundred different directions that could go in to leave the door open for some pretty funny stuff. But the movie never left the tracks and never gave itself a chance to cash in on the formula that worked in the past three films. Illumination is going to have to accept that Gru is actually unable to carry a movie by himself without the minions. The screen time for the minions in this third installment was very limited and their effect on the resolution of the conflict was negligible. The fact that the minions were nearly non-existent in this movie is what convinced me that Illumination is trying to put Gru back on top of the Despicable Me mountain. It doesn't work. Minions slapstick combined with Gru's ability to get resolutions to issues through chaos are big parts of why the previous movies worked. None of that is here, and it affected the quality of the film. Illumination continues to advance the art of the animated film without being caught up in making things look "too real." I like that about Illumination. They make cartoons, and they don't seem to be too interested in how real their cartoons look. But the action in Despicable Me 3 is a joy to watch, and the characters are still designed and "drawn" to appeal to kids. The presentation of a Despicable Me movie is as flawless as modern animation gets, and that always makes these movies watchable. But when the other elements are removed, we start to see how worn out the Gru character really is. The brilliance of Illumination writing is on display in the first three or four minutes of the movie when the villain in Despicable Me 3 is established. Within just a couple of minutes, we get all of the backstory we need on the villain, his motivation for being a villain, and his entire unique personality. I was absolutely impressed with how quickly and efficiently the movie set up the bad guy to the point where I already did not like him. But the movie slows down after that point, and it settles into a path that the previous movies avoided with emphasis. All in all, this is another Illumination movie that will entertain everyone in the family and it looks great on the big drive-in screen. Despicable Me 3 is the epitome of a fun night at the drive-in, and I would recommend it to anyone. George N Root III is a movie fanatic who lives for the drive-in. 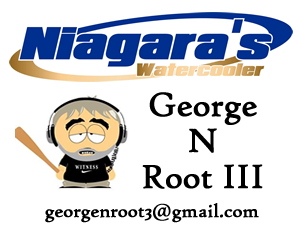 Follow him on Twitter @georgenroot3, or send him a message at georgenroot3@gmail.com.